Hisao Dōmoto (1928-2013) was born in Kyoto to a family of artists and connoisseurs. His father collected traditional Japanese ceramics, calligraphy and painting, and his uncle Inshō Dōmoto (1991-1975) was a famous nihonga painter. Dōmoto studied nihonga (traditional Japanese painting) at Kyoto Shiritsu Bijutsu Senmongakko (Kyoto City University of Arts) from 1945-1949. In 1948, while still at university, one of his works was selected for the Nitten (Japan Fine Arts Exhibition), an achievement that raised high hopes for his future. In 1952 Dōmoto travelled with his uncle Inshō to Italy, France and Spain where he first encountered Western art, an experience which eventually motivated him to take a studio on the Left Bank of Paris in 1955. Dōmoto found it increasingly difficult to continue using Japanese pigments and soon switched to oils, allowing his painting to take on a more abstract and expressive flair. At around the same time he became associated with Art Informel (Art Without Form) a Paris based influential art movement headed by the artist/critic/dealer Michel Tapie (1909-1987). Informel is stylistically characterised as a painterly abstraction focusing on materiality, improvisation and gesture. Domoto was an instant success in Paris and became friends with other emerging painters such as Soulages and Zao Wou-ki. His first solo exhibition at the Stadler Gallery, Paris 1957 was highly successful and in the same year his work appeared in an exhibition organized by Michel Tapie entitled L’art Mondial Contemporain a Tokyo. 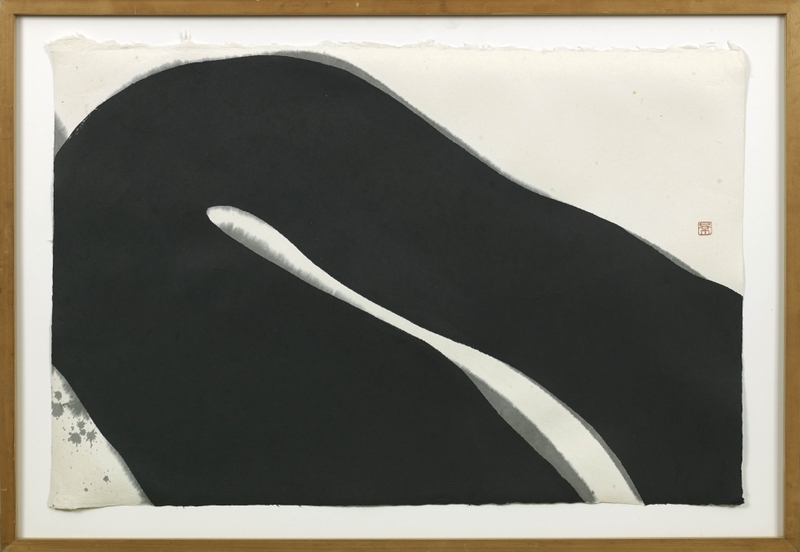 In the same year Dōmoto introduced Tapie to the Gutai journals published by his friend Yoshihara Jirō (1905-1972) Yoshihara was the founder of the Gutai group, the first radical, post-war artistic movement in Japan. The French art critic was delighted to discover what he perceived as a Japanese manifestation of his own revolutionary aesthetic and immediately drew connections between the two, extending Informel’s reach globally and curating various international collaborative projects. Anformeru (as Informel was known in Japan) was the first truly contemporary art movement to arrive in post war Japan and it dominated Japanese painting well into the early sixties, overshadowing the previous trends of Fauvism, Surrealism, and Social Realism. 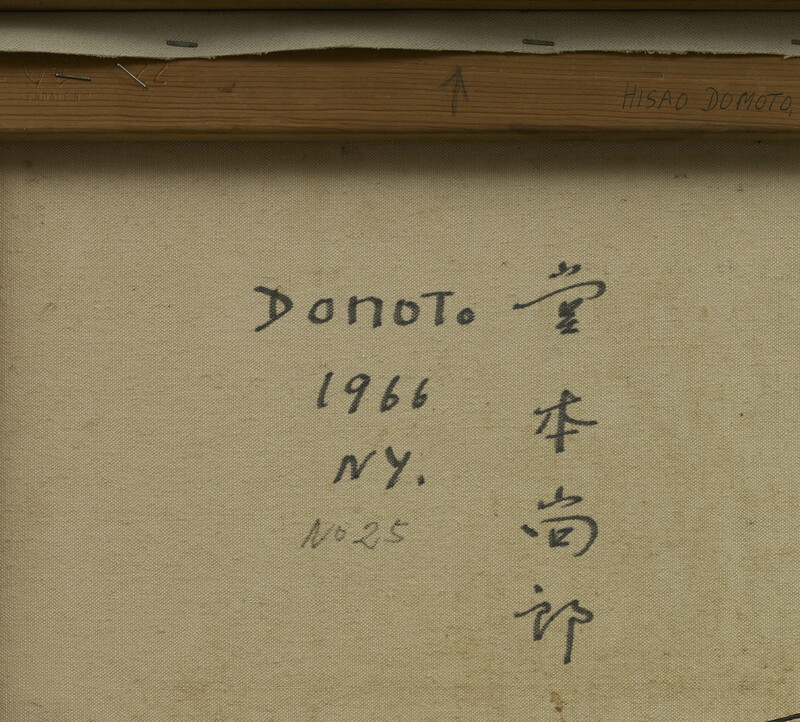 In 1958 Dōmoto collaborated on a special issue of the Gutai journal entitled L’Aventure Informelle and visited New York in the same year for his first solo exhibition at the Martha Jackson gallery. There he met with Jasper Johns, whose White Flag made a lasting impression on him. Dōmoto departed from Tapie and Informel in 1962 and started the Solutions de Continuite (Solution of Continuity) series in 1963 using heavy impasto (thickly applied paint) in vertical and horizontal strips which are then scraped back to reveal other previously applied colours beneath. The flat film of colours which appear to pry open the deliberate placements of paint indicates Dōmoto’s anguished search for a much clearer, more ordered vision than Informel. Feeling that he did not share the cultural heritage of his European peers such as Jean Dubuffet and that Europe was no longer for him, Dōmoto finally decided to return to Japan in 1966 where he believed his efforts to create a style of his own with the series Solutions de Continuite would be better appreciated. In the 1970s he employed repeated circles in his works and abandoned the use of oil colours deeming them ‘unsuitable for Japanese artists’. During the 1980s his range expanded and included zigzag lines in a wide range of acrylic colours starting the series Chain Reaction. 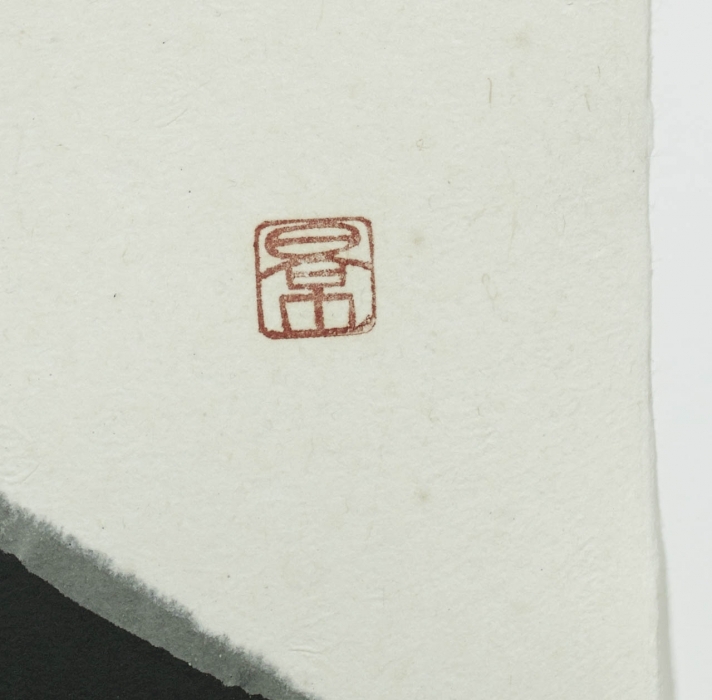 At the same time Dōmoto was drawn to traditional Zen iconography as perfected by the early 19th century master Gibon Sengai (1750-1837). 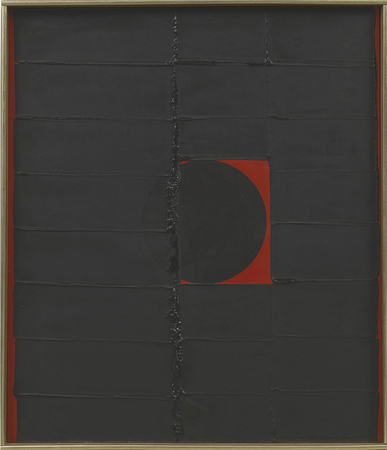 Dōmoto’s intention to borrow from Sengai is exemplified by his use on large acrylic paintings of a circle-triangle-square combination that Sengai made to encompass all possible forms, to represent all existence. However, Dōmoto’s innovation is to employ acrylics in bold colours in a highly finished, complex manner that is, in the end, worlds apart from Sengai – and thus idiosyncratic, original and fresh. From 2000’s he began a more traditional water-based series entitled Between Unconsciousness and Consciousness. These monochromatic works with pigments splattered on canvas often depicting the lotus flower and pond, evoke a sense of a more familiar iconic Asian style. Works by the artist can be found in the collections of: Albright-Knox Art Gallery, Buffalo, New York; Museum of Modern Art, New York; Grey Art Gallery and Study Centre, New York University, New York; Hirshhorn Museum and Sculpture Garden, Smithsonian Institution, The Martha Jackson Memorial Collection, Washington D.C.; Museum of Fine Arts, Houston, Texas; Phoenix Art Museum, Phoenix, Arizona; Museum of the City of Kyoto; National Museum of Modern Art, Tokyo; Musée National d’Art Moderne, Centre Georges Pompidou, Paris; Musée d’Art Moderne de la Ville de Paris, Paris; Galleria Nazionale d’Arte Moderna, Rome; Galleria Civica d’Arte Moderna, Turin; Kunstverein, Cologne; Museo de Rufino Tamayo, Mexico D.F. ; Museu de Arte Moderna do Rio de Janeiro, Rio de Janeiro. 2001 Ordre des Arts et des Lettres awarded by the French government in recognition of significant contributions to the arts. 2007 Title of Bunka Kōrōsha (Person of Cultural Merit) awarded annually to people who have made outstanding cultural contributions. Categories: modern/post-war, Paintings. 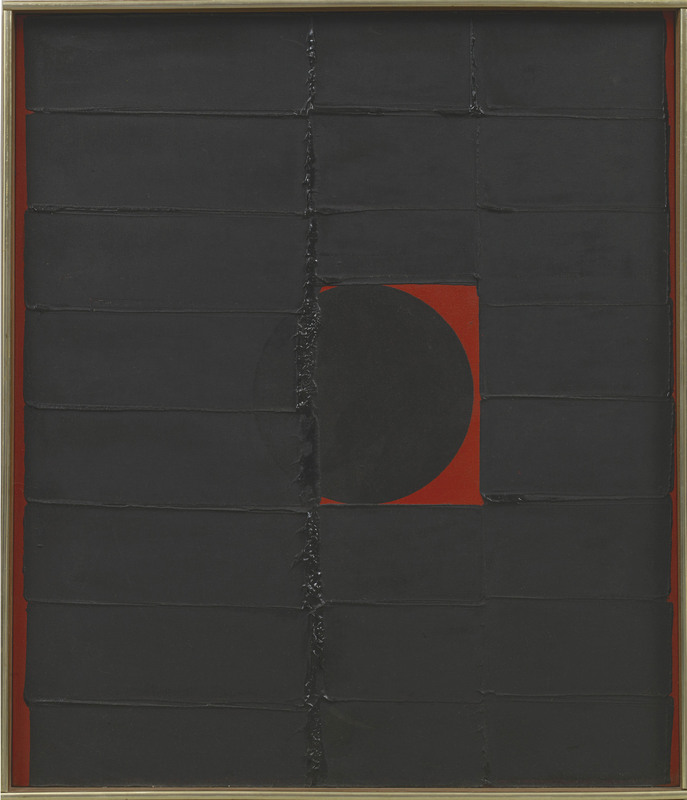 Tags: abstract, art, black, circle, domoto, modern, painting, post-war, red.